Synthetic Sapphira vs. Glass, Fused Quartz & Silica | Rayotek Scientific Inc.
Glass is an amorphous solid which means its atoms are randomly oriented. Whereas, a crystalline material may contain the exact same type and quantity of atoms as glass, but the atoms are ordered in rigid, well-defined patterns. Fused quartz glass vs. crystalline quartz is a good example of the same type of atoms (SiO2) structured in such a way that one orientation forms a glass and another forms a crystal. Crystalline materials are solid and keep their shape until they reach a very specific temperature, at which time they become fluid. In contrast, all glasses, by definition, are always a fluid. The viscosity of glass is determined by the temperature of the glass; even at room temperature glass is moving, albeit very slowly. When product tolerances are very tight and temperatures are elevated, a crystalline material is superior to glass because it will maintain its shape at any temperature below the melting point. Conversely, glass will change shape over time, regardless of the melting point and especially at elevated temperatures. Both crystalline solids and glasses are normally colorless in the pure state. Impurities are actually what give sapphire and glass their color. The impurities also change the mechanical, thermal, and optical properties of both material types, especially for glass. Why/why not fused and synthetic quartz? • Cost of material. Sapphire often costs more than other refractory materials. But not always! products where the labor is the primary cost. that can be grown. Therefore, maximum part size cannot exceed 300mm for two of the dimensions. • Larger pieces can be thermally shocked and broken if not heated uniformly. Fused quartz and fused silica are the amorphous form of quartz. Fused quartz is made from purifying and melting natural crystalline quartz, usually natural quartz sand. Fused silica is a purer version of fused quartz that is made from various silicon gasses. Chemically known as SiO2, silica is "pure" glass. All other commercial glasses are SiO2 with other dopants added to lower the melting temperature and modify optical, thermal and mechanical characteristics. WHY FUSED QUARTZ AND FUSED SILICA GLASS? WHY NOT FUSED QUARTZ AND FUSED SILICA GLASS? must be ground and polished from a large block. Borosilicate glass is an "engineered" glass developed specifically for use in laboratories and applications where thermal, mechanical and chemical conditions are too harsh for standard, household-type glass. Some common names of borosilicate are Pyrex ™ by Corning and Duran ™ or borofloat ™ by Schott Glass. Like most glasses, the main component of borosilicate glass is SiO2 with boron and various other elements added to give it its excellent qualities. the risk of breakage due to thermal shock. • Cost. 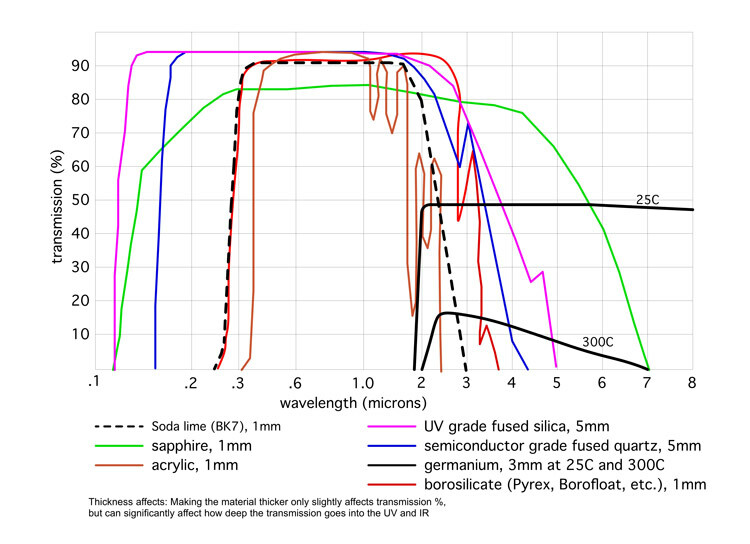 Borosilicate is usually 2 to 3 times more expensive than soda lime material. • Not as thermal shock resistant as quartz, which has a coefficient of expansion ~60x less. Although soda lime glass typically has a green or blue-green tint to it, the iron content can be reduced to the point where the glass becomes crystal clear, also known as "water white." times and faster production rates. • Easily "floated," making it a very low-cost, flat (float), optically clear sheet glass. • Softer than borosilicate and quartz, making scribe cutting easier and faster. (and often required) safety feature. WHY NOT SODA LIME GLASS? Glass ceramic is a clear, light amber-tinted or opaque black material. It comes stock in only 3mm, 4mm and 5mm thicknesses. It has many of the thermal performance properties of fused quartz including a very low coefficient of expansion. For fabrication capabilities, it is more like sapphire, as it cannot be melted or welded. It is not nearly as good for optical applications as fused quartz, sapphire, soda lime or borosilicate. However, it is ideal for furnaces and fireplaces with windows where the tint of the glass ceramic is not a cosmetic problem. Exotic Glass is used in specialized applications where more the common glasses do not meet the optical, electrical or mechanical requirements. Many of these exotic glasses can be molded to at least 2 dimensional curves. Special care may be necessary for some glasses because of a tendency to devitrify or crystallize when softened and then re-cooled.